Nice long run. We were told to not have any miles faster than 6:00. We did just that and averaged 6:07. Felt good, pretty relaxed as well. AM-13 easy miles up at Deer Creek. PM-5 easy miles with Alex to the river trail. Feeling good. School starts tomorrow, so I'm a bit nervous for that. These past couple weeks of not taking classes have been nice. PM-5xmile on Kiwanis Park, 3 minutes recovery. I felt pretty good the first two, which were 5:00. The third one was around 4:58, but felt a bit harder. The fourth one was good and we were around 4:54. The last one felt good until the last 200m or so. 4:52. The park is a bit hilly and the turns are fairly abrupt, so I felt like this was a great workout. Weights after. PM-10 miles and then some strides. PM-10 easy miles. Felt sore for the first 7 or 8. We had weights two days in a row and I felt sore from it. PM- hobble creek workout. 6 man governor plus Jared Ward. It was really hot, however I believe I had a great workout. Stomach was in pain afterwards. Not as fast as last time, but last time had a lot better weather. Long run. We ran on a beautiful trail from squaw peak to hobble creek canyon. The leaves just started changing colors and the views were amazing. Afterward I was exhausted, but my legs felt great on the run. PM-12 miles for the medium long run. After I did strides. Felt a bit more tired than I thought I would. AM-5 easy miles with Marcus and Clayton. PM-hard workout. 3x2 mile with 5 minutes rest. Had a stomachache prior to the workout, but told myself to make it through the first one and see where I was. First one I ran with Danny, next one Rory and Clayton led and I just stayed behind them. I felt bad after this one, but didn’t say anything. In the third one I just told myself to stay with the group as long as I could. During this rep I felt better, and told myself to work harder for the team. It helped me get through it. I took a turn leading the group for a bit on the end one, which made me think I felt better than usual. We did all these at intramural field, and it was hot. AM-9.1 miles with Talem and Michael. Felt a bit stiff. PM-Around 5 miles. Felt a bit stiff and had a stomache ache. It may be due to the iron that I've been taking, or just from poor planning on when/what to eat. PM-6x800m. It felt pretty easy. The workout wasn't anything crazy because we're racing in two days. We did it on Intramural field. One to one recovery. 2:23, 2:21, 2:18, 2:16, 2:17, 2:16. Last one was started out slower, but our last 200m we were cruising. AM-Just over 3 miles. It was pretty smoky. PM-Ran just under 6 miles. Due to the large amount of smoke in the air, the race has been changed to Utah State. I ran the first 4 miles on the treadmill at 6 min. pace and the next two on the indoor track. Got to the course about 90 minutes before we started. Started warming up about 50 minutes before the race. Felt pretty good. A slight bit of tightness in my right hamstring, but luckily we weren't starting out insanely fast, so I wasn't too worried. Goal was to stay at 4:50 pace for the first 4km, then the last 3km speed it up and have separation. The start is downhill and is a long stretch, so it was pretty quick. Luckily the race wasn't too packed, so even though I got out slow the first 200m, I caught up without having to weave around too many people. I stuck to the left and had the edge on the first 4 turns, which was nice. I got right behind Rory, then right next to him and ran side-by-side with him for most of the race. It was enjoyable to run with teammates for a race again, although it made it hard to view it as a race. I felt pretty good through the first 3 km. At one part I looked back to see where our team was and saw Zac right behind me. It was fun to see because right now he's the only other one running cross country that signed with me. Right before 4km I was next to Luke Beattie, and was actually feeling a bit beat. At the turn right after 4km, McMillan jumped out in front of all of us, and I thought to just let him go. Then Shumway made a move as well, and his wasn't as quick of an acceleration, so it was easier to go with and catch up to McMillan. I ran behind McMillan for a bit, then Danny passed me after a bit and then Rory passed us and we were pretty together. The last 300m was interesting because I felt like I was pushing and going really fast, but it seemed relaxed. After it was nice to talk to people that I hadn't seen in a while. 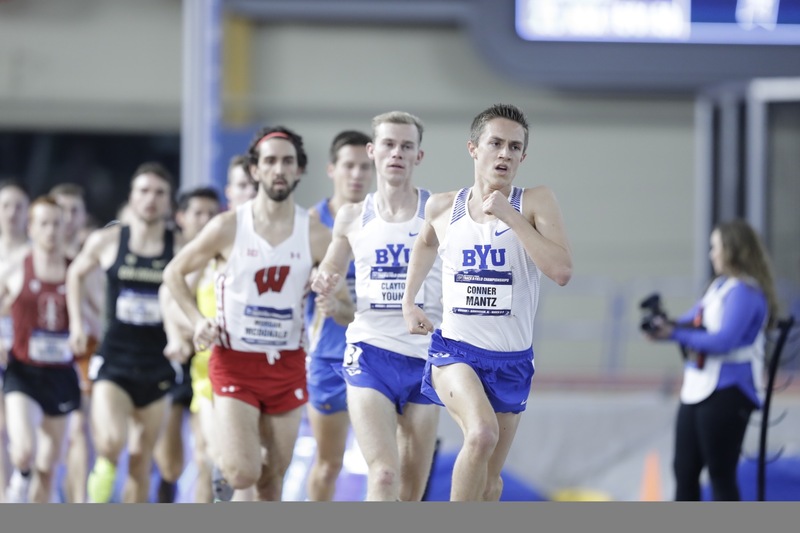 I'm from Smithfield, so racing in Cache Valley felt like home again. 6 mile cool down after. PM-6 miles with strides on the grass. AM-5 easy miles inside due to air quality. PM-6 mile tempo. While the air quality was better than this morning, it was really hot. Either 90 degrees or just under. I could feel my shoes getting pretty hot. We ran in trainers instead of flats. Goal was 5:05 for the first 3 miles and then see what happened. We started out at about 5:08-09 for the first three miles. Clayton and I ran together for the majority of the workout. I was hoping to go under 30 minutes, but due to the heat it just didn't happen. Not sure on the 4th and 6th mile, but our fifth was 4:58. We had a big group at 3 miles, but after that it spread out quite a bit. Overall time was 30:35. It was a tough workout, probably tougher than the race last weekend. Weights after. PM-10 easy miles at fire road to stay out of the smoke. PM-Michigan workout. 3 miles warm up/strides, then track mile: 4:32, grass mile:5:00, track 1200:3:25, grass mile: 4:55, track 800: 2:15, grass mile: 4:53, track 400: 61, grass mile: 4:45. A bit faster on the grass miles than when I did this in the spring, but a bit slower on the track. 60-90 seconds rest between grass/track. I felt really good today, never had any thoughts of wondering if I could finish this workout. The 400m felt super relaxed, so that's good to see I still have some easy speed in me. The last grass mile was probably our most impressive. 3 miles cool down. Jog in between intervals. PM-8.1 miles at deer creek. Long run up at Jeremy ranch. I’m feeling pretty tired. Ready for a day off. PM-8 mile power run. Started out around 5:20 and gradually got faster. 41:30 for the 8 miles. AM-9 easy miles before the flight. PM-3 easy miles on a treadmill at the hotel. AM-8 easy miles with Weaver. I may have run more that 13.5 today, but at least 13.5. Anyway I had a two mile shakeout in the morning, ate a big breakfast, then waited til we left. Warmed up about 2-3 miles and then got my spikes and did strides. I started out on our back line and was near the back(probably in the last 20 or 30). Nice thing about this course is that you can take the turns as wide as you want, so I got on the outside for the first few turns. I was with Zac and Jake at this time. I could rory about 10-15 meters ahead of me and knew that if he was back this far then he was being patient and the front pack wasn’t dropping it at the beginning. Eventually I caught up the front group at about 1.5 miles. I just stuck on the shoulder of Clayson and Garrett Corcoran. When I went to take the lead it was windy so I just waited. Somewhere around mile 3 McMillan took the lead and led with Clayson. I was feeling pretty tired after a mile, but just tried to focus on staying with the pack. McMillan, Clayson and I were all in the lead with a mile to go. Then Danny, Aaron Templeton and Paul Roberts passed Clayson and myself, I stayed in fifth and was hurting. I just stayed with the group. With about 600-700 meters to go Paul made a move and the group dropped me. I tried to finish strong, but they all put about 5-10 seconds, so I must not have kicked well. Overall this was a good race. It was pretty fun, but also humbling because the time wasn’t what I was hoping for or imagined that would come(the course and conditions were near perfect) so I think I just need to continue working hard. Cool down to the giant mural of Christ (also known as “touchdown Jesus”) and around watching the open race. Long run today. Kept it faster than I wanted to. I didn’t get much sleep last night due to getting home so late. I need to work on recovering today and tomorrow. Good run though.